With the third Thor movie, Marvel Studios did an effective job of bringing humour to the Avengers universe. 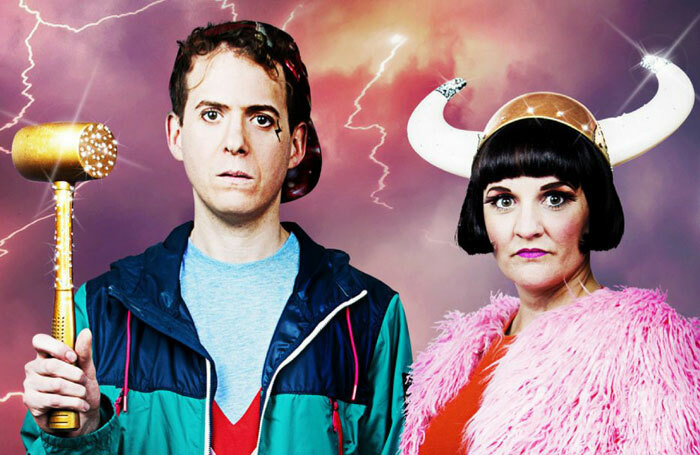 Thor and Loki, a new comedy musical by the House of Blakewell team, does not even attempt to wade into the same waters. This is not a riff on the film’s stars Chris Hemsworth and Tom Hiddleston’s double act, rather a good-natured account of Ragnarok, the twilight of the gods – with songs. Thor (Harry Blake), god of thunder and Odin’s favourite son, doesn’t view his incredible strength as gift. He’d much rather be writing poetry and playing the cor anglais. Loki (Alice Keedwell) is the giant all the other giants make fun of, but she has hidden strengths of her own. Eleanor Rhode’s production is a lot of fun – there are show-tune pastiches and tap routines – if overloaded with plot and on the long side for something so essentially feather-light. It is not subtle: Odin deals with the prospect of Asgard being invaded by marauding giants by building a huge wall. But it is frequently entertaining and performed with gusto. Blake’s amiable Thor deflates talk of battles and hammers with his well-timed asides, Jennifer Fletcher’s choreography and Harrison White’s musical direction are slick and the underlying message about self-acceptance is sweet. While the whole thing could stand to be tighter, if you manage your expectations accordingly Thor and Loki is a very enjoyable piece of fringe silliness.